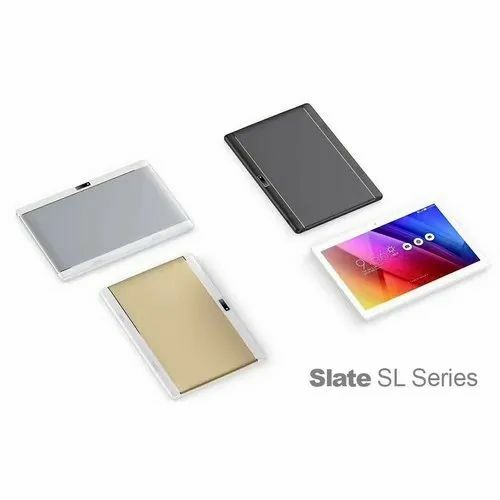 We are proudly introducing the newest contender in the DOMO Slate SL Series - the Slate SL33. It's a 10.1" 3G based calling tablet with DUAL Sim Slots and boasts of a QuadCore CPU, 2GB RAM, 16GB Internal Storage, Dual Camera which are interpolated to 5MP and 8MP, 4500 mAh Battery and a Metal Housing. DOMO as always assures quality of its products and just like other Slate series, the SL33 is Made In India as well. With Mobile Network Connectivity and Data, equipped with WiFi, Bluetooth and GPS, capable of connecting external pendrives and other usb devices via OTG, smart features such as 3G Internet Surfing and Voice Calling, Call Recording, FM Radio, DUAL SIM Slots, WiFi Hotspot, WiFi Direct, USB Tethering, Bluetooth Tethering, USB Internet Sharing from PC and a range of other features, the Slate SL33 is sure to surprise you with the punch it packs in its sleek 10.1" metal housing.